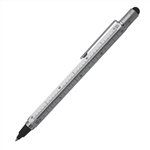 The Monteverde Stylus Inkball Tool Pen is cleverly designed ink ball pen from Monteverde includes nine useful tools in one premium writing instrument ! 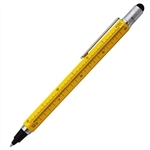 Perfect for the master builder, architect, interior designer or anyone who values precision. In a fast paced world, having the right tools at hand is crucial, and The Monteverde Stylus Inkball Tool Pen brings 9 tools in one premium quality writing instrument! For those who like the freedom to use their favorite ink cartridge but like the convenience of a roller pen, the Inkball is the perfect pen! The Monteverde Stylus Inkball Tool Pen, as you might have guessed, a multi-functional pen with a couple of tool elements. You can unscrew the stylus off the top. Underneath the stylus we have a screwdriver. That can also be reversed so you have a philips screwdriver on the other end. You can replace the stylus back on the top. On the other end of the pen is the Inkball pen. It has a cap that unscrews from the pen. 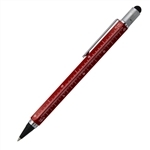 Monteverde Stylus Inkball Tool Pen fill with Monteverde® standard international G3 ink cartridges(included). To replace the refill or add ink to the pen you simply pull the tip section from the barrel when the cap is in place. It is just a compression fit. Included with the pen is one ink cartridge inside of the barrel of the pen. You simply insert that ink cartridge by pressing it into the tip section of the pen. You then insert that tip section back into the pen to use it.